Both of these stocks could benefit from the Trump presidency. Which is the better buy now? I've written many times before about Berkshire Hathaway (NYSE:BRK-A) (NYSE:BRK-B), and how if I could only own one stock, it would probably be the one. However, Berkshire has soared 22% in 2016, and thus, is naturally less attractive than it was at this time last year. With that in mind, let's take a look at Berkshire as compared to another stock I have my eye on right now, General Electric (NYSE:GE). Which stock could lead your portfolio down the right path? Image source: Getty Images. Aside from having Warren Buffett, the greatest long-term investor of all time, at the helm, there are plenty of good reasons to like Berkshire over the long run, no matter who is at the CEO's desk. What's more, Berkshire also has a large stock portfolio, much of which was hand-picked by Warren Buffett himself. The portfolio contains the common stock of more than 40 companies, including massive stakes in some of the best-run companies in the market, such as Wells Fargo, Kraft Heinz, Coca-Cola, IBM, and American Express, just to name a few. It's worth noting that Berkshire does own shares of General Electric; however, at $336 million, the stake is rather small (for Berkshire). For comparison, consider that Berkshire's Wells Fargo stock is worth about $26.5 billion. In addition to the collection of businesses and stock investments, another reason to love Berkshire is its flexible, solid balance sheet, which currently has about $85 billion in cash, just waiting to be put to work on more attractive investments as opportunities arise. Finally, Berkshire Hathaway should be a big beneficiary of the Donald Trump presidency, as Trump's anti-regulation platform and potential to create a rising-rate environment should help several of Berkshire's businesses and investments -- particularly the insurance subsidiaries and the big bank holdings in the stock portfolio. From a valuation standpoint, I mentioned how Berkshire's share price has risen by nearly 22% in 2016. However, the stock is still cheaply valued, in a historical context. 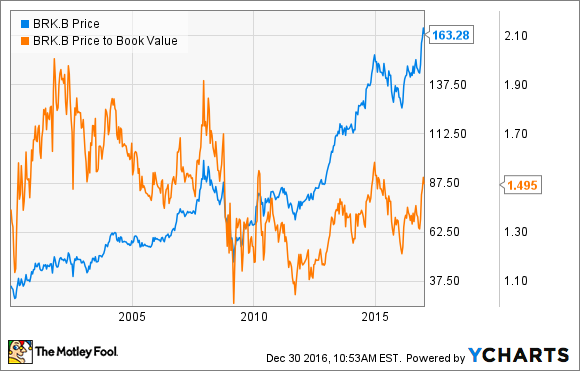 As of this writing, Berkshire trades for just under 1.5 times its book value. This is well over the threshold of 1.2 times book value Buffett likes to see in order to implement share buybacks, but it is still quite low in a historical context. In fact, before the financial crisis, it wasn't uncommon for Berkshire's price-to-book-value ratio to exceed 1.7. General Electric has been a beneficiary of the post-election "Trump rally" like most of the market, but unlike Berkshire, GE hasn't had a great 2016. In fact, the stock gained just over 1% for the year. Not only does GE pay a handsome 3% dividend and trade for a reasonable 19 times forward earnings (Berkshire's forward P/E is 20.4), but I think it has the potential to be one of the biggest beneficiaries of Trump's presidency -- even more so than Berkshire. Specifically, President-elect Trump's plan to spend $1 trillion on infrastructure over the next decade could greatly benefit many of GE's businesses. Just to name a few examples, GE makes energy grid systems; water treatment systems; power-generation equipment such as gas, steam, and wind turbines; and locomotives -- all of which could see demand rise dramatically over the next few years. Many of these product divisions could be greatly helped by Trump's pro-energy agenda as well. Another potential boost for GE shareholders could come in the form of Trump's proposed repatriation tax holiday. General Electric has more than $100 billion in cash stashed overseas, and Trump has proposed to allow companies to repatriate foreign profits at a one-time discounted tax rate of 10%. This alone could save GE tens of billions of dollars. It's tough to say. On one hand, Berkshire Hathaway is one of my largest stock holdings, and one that I'll probably continue to add to as time goes on. Furthermore, if we had done this comparison before the election, it would have been no contest. However, I think the Trump presidency could be a huge positive catalyst for General Electric if Trump follows through with his promises. So, while I still think Berkshire is one of the best long-term stocks you can buy, and is almost an all-in-one investment portfolio by itself, things just got a lot more interesting for General Electric investors, and I may consider adding it to my portfolio in the new year.